Every reader’s dream is to be locked in a big library or bookstore for the night. In Berlin, there is a place where this could almost happen: Dussmann das KulturKaufhaus is opened until midnight, which is an utter exception for Berlin: shops here usually close around 8. I personally don’t mind our sleepy opening hours compared to other big cities because I rarely feel the need to go shopping that late. However, if there is a last-minute birthday present to get or simply the desire the find something new to read, browse through some recently released books or old classics, Dussmann is my place to go. 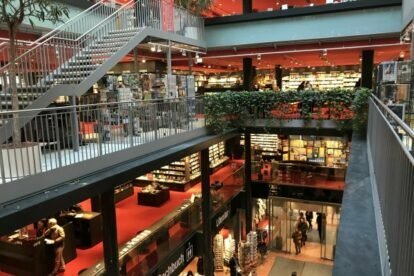 This bookstore also offers a design gift section, stationery and wrapping papers, movies, music as well as a well-thought program with concerts and readings. More than anything, Dussmann is very quiet and spacious, with lots of different corners to linger around and forget about how time pass. Important to note: In the very back of the building, there is a separate international bookstore, which offers Germany’s biggest selection in English (!) as well as another 11 languages. No matter what you search for, Dussmann employees are very helpful when it comes to finding a specific book or even just a recommendation. Also, their online bookstore is great if you’re looking for an alternative e-commerce outlet with free shipping. Dussmann das KulturKaufhaus may seem like another big department store at first sight; their attention to detail and unique opening hours make them a cultural institution in Berlin.